Originally hailing from India, Chai Tea has become a staple in coffee shops the world over. Like many traditional dishes, there are differing methods of preparation, with each claiming to be the best, or most authentic. Some versions of this tea are brewed directly in milk, which is amazing and delicious. However, for maximum storability, we’ve chosen to brew this one in water, and add any dairy or non-dairy milks after the initial cooking. This tea blend looks just beautiful in a jar, and so makes an excellent gift, too. Just leave out the ginger, or tie the whole knob on top! The other spices will last for many months in a canning jar. 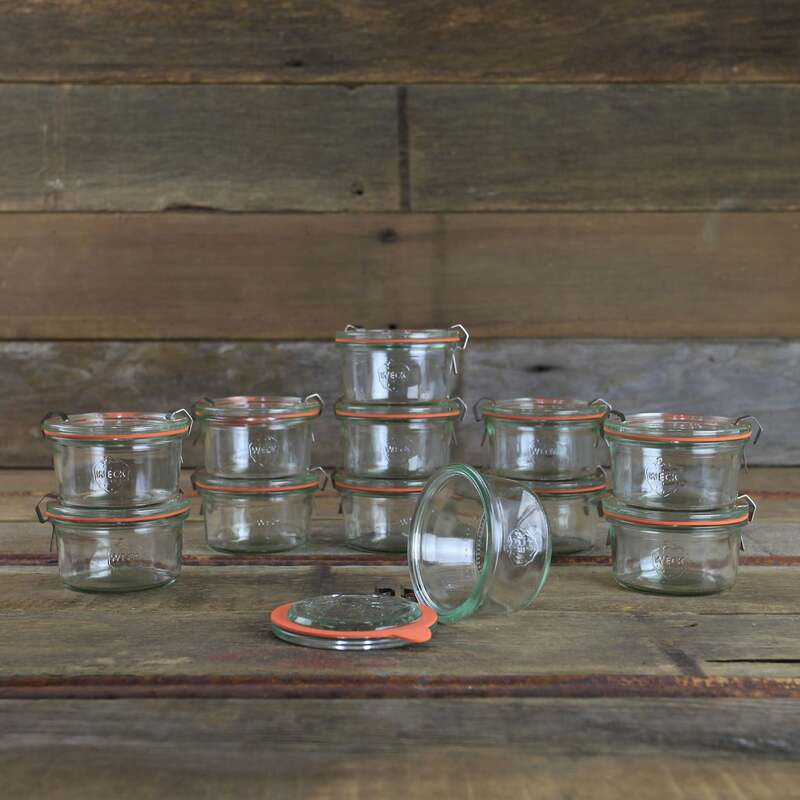 Here, we used the Weck 976 Mini-Mold jar, which holds the blend perfectly. This blend is spicy, heavy on the pepper and ginger, so expect to be seriously warmed! If you prefer a milder version, reduce the amount of peppercorns and ginger by a third, or dilute the finished tea with water or extra milk. TIP: We recommend the use of whole spices here, in part to get the maximum flavor and freshness, but also because pre-powdered spices often settle to the bottom of the stored tea, making for a sludgy last cup. If powdered spices are what you have handy, use ‘em! But you may wish to filter the tea with butter muslin or a coffee filter before storing it. We’ve given you a large recipe, one that is intended to make at least a dozen cups of tea. The instructions describe how to make a tea concentrate, without the addition of milk or sweetener. The concentrate can then be used to make individual cups of tea, and tailored to each person’s preference. This recipe makes about a half gallon of Chai Tea concentrate, and may be stored in the refrigerator for 2 weeks. Combine all ingredients in a stock pot and bring to a boil. Reduce heat and simmer on low for 1 1/2 hours. (This is easy to do on top of a woodstove, too!) Soon the whole house will smell warm and spicy. Some of the water will evaporate; that’s ok! Let it simmer without adding more water. Traditionally, chai is made with black tea. If you wish to caffeinate and flavor the whole batch of tea concentrate, steep 6-8 teaspoons of black loose-leaf tea in the still-hot tea at this time, for 3-5 minutes. For those with children in the house, or who are sensitive to caffeine, it may make more sense to omit this step, and steep the tea (or not!) in each individual cup as it is reheated for serving. Rooibos red tea is another option. Strain out the solids, and pour the chai into a half gallon jar for storage. To make a cup of tea, heat the desired portion of chai concentrate in a saucepan. Use 1 part concentrate to 1 part milk. If the tea seems too spicy, 1 part water may also be added before heating. The milk can be warmed with the tea or separately, but take care not to boil the milk. If the concentrate does not contain black tea, a single teaspoon or teabag of black tea may be steeped in the individual cup for 3-5 minutes. Sweeten each cup as desired, with honey, agave syrup, or sugar. This recipe features the Weck 976 Mini-Mold Jar, a wonderful option for gifting your Chai blend to a friend!